Do you add salt or chemicals to your water in attempt to remove Iron and Manganese? Perhaps you have suffered from Iron or Manganese stains and the odor from Sulfur for far too long? 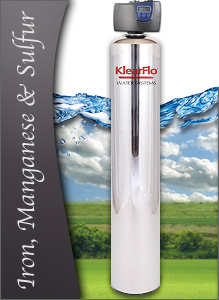 Having a KlearFlo Iron Filter will allow you to filter Iron, Manganese and Sulfur naturally. No more chemicals or salt. No Iron, Manganese stains or rotten-egg odors inside your home. No Stains on Sidewalk, Driveway or House. No more hauling or lugging salt bags. Easier on your Skin and Hair without the iron and manganese. Limited Lifetime Warranty on housing & tank. Imagine better tasting water through every faucet in your home. Drink, bathe and shower in cleaner water. No more stains, no more dry itchy skin or unpleasant odors. KlearFlo wants your water filtration experience to be enjoyable, positive, remain healthy and we want to provide you with the filtration results you expect. You can expect the best when you buy KlearFlo! The main function of iron filters is to remove the bad taste and smell from the water along with unwanted staining. Iron filters do not require a lot of maintenance, and can provide the better tasting and safer water. 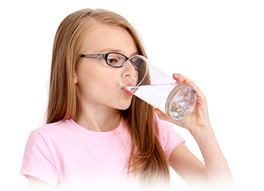 With improved taste, the filters also remove odor providing you with better tasting drinking water. They provide an excellent value for your money and definitely a better choice than bottled water. If you've ever cooked pasta in filtered water or made coffee or tea using filtered water you can definitely tell the difference. Iron and other contaminates can adsorb into your foods, and make your sauces and hot drinks taste foul. All top restaurants, chefs and coffee houses use filtered water now so they can produce a great tasting product every time. Your skin is an organ, whose pores can soak up everything that is in your water; including iron and contaminates while bathing. Because your skin does this, it can leave your skin itchy and uncomfortable. Iron, Manganese & Sulfur Media - KlearFlo utilizes a special blend of only the best high-grade media in our KlearFlo Iron, Manganese and Sulfur Filter. This media is designed to filter iron, manganese and sulfur from your well water. KlearFlo Backwashing - An upward flow of water will lift the filter bed, removing smaller iron & manganese sediments captured in the media, then pour these sediments down your drain. During this process of the backwashing, our KlearFlo Iron Filter will also inject oxygen into our media in order to oxidize these contaminates for proper filtering. Future Replacement Media Every 5 Years for Optimum Performance -Iron filtration takes clear iron and transform it to rust or ferric iron in the process known as oxidation. These trapped particles are periodically and automatically backwashed out to drain, usually once or twice a week. Iron and manganese are metals often found dissolved in water. They cause stains when exposed to air in the laundry, bath, etc. by oxidizing or "rusting." The KlearFlo Iron Filter media oxidizes dissolved iron and manganese on contact, as the water flows through causing these elements to precipitate (or form solids) in the bed of the filter. The iron filter backwashes these small particles to drain every few days, thereby cleaning and restoring the filter media. 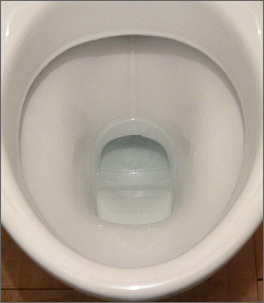 *If you have acidic water with a pH level below 7.0, you may need to neutralize your pH with KlearFlo's pH Neutralizer in order to filter out iron, manganese & sulfur. **Life expectancy is only achieved with proper backwashing on a regular scheduled basis. If you do not have a drain available, then we highly recommend one of our BIG3 Whole House Cartridge System. KlearFlo Water Systems warrants to the end user (customer) that it's Pre-filter housing with mounting bracket and media tank will be free from defects in material and workmanship under normal use and service for the life of the system. No warranty is made with respect to defects or damaged due to neglect, misuse, alterations, accident, misapplication, physical damage, installation on water quality outside guidelines for system or damaged caused by fire, acts of God, or freezing. KlearFlo Water Systems warrants to the customer that it's entire valve assembly will be free from defects in material and workmanship under normal use and service for up to 5 years of the system. No warranty is made with respect to defects or damaged due to neglect, misuse, alterations, accident, misapplication, physical damage, installation on water quality outside guidelines for system or damaged caused by fire, acts of God, or freezing.